ST. GEORGE was born in Cappadocia, at the close of the third century, of Christian parents. In early youth he chose a soldier's life, and soon obtained the favor of Diocletian, who advanced him to the grade of tribune. When, however, the emperor began to persecute the Christians, George rebuked him at once sternly and openly for his cruelty, and threw up his commission. He was in consequence subjected to a lengthened series of torments, and finally beheaded. There was something so inspiriting in the defiant cheerfulness of the young soldier, that every Christian felt a personal share in this triumph of Christian fortitude; and as years rolled on St. George became a type of successful combat against evil, the slayer of the dragon, the darling theme of camp song and story, until "so thick a shade his very glory round him made" that his real lineaments became hard to trace. Even beyond the circle of Christendom he was held in honor, and invading Saracens taught themselves to except from desecration the image of him they hailed as the "White-horsed Knight." 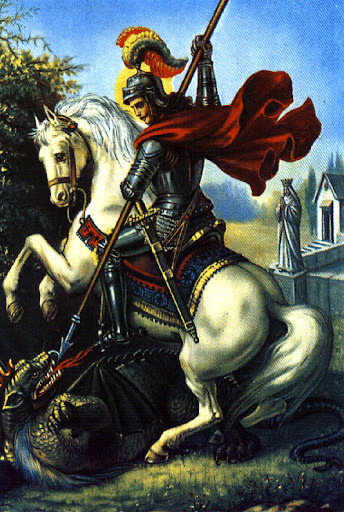 The devotion to St. George is one of the most ancient and widely spread in the Church. In the East, a church of St. George is ascribed to Constantine, and his name is invoked in the most ancient liturgies; whilst in the West, Malta, Barcelona, Valencia, Arragon, Genoa, and England have chosen him as their patron. Reflection.--"What shall I say of fortitude, without which neither wisdom nor justice is of any worth? Fortitude is not of the body, but is a constancy of soul; wherewith we are conquerors in righteousness, patiently bear all adversities, and in prosperity are not puffed up. This fortitude he lacks who is overcome by pride, anger, greed, drunkenness, and the like. Neither have they fortitude who when in adversity make shift to escape at their souls' expense; wherefore the Lord saith, 'Fear not those who kill the body, but cannot kill the soul.' In like manner those who are puffed up in prosperity and abandon themselves to excessive joviality cannot be called strong. For how can they be called strong who cannot hide and repress the heart's emotion? Fortitude is never conquered, or if conquered, is not fortitude."--St. Bruno.